Lots of Seattleites drive the green status symbol, all right, but for the highest rate of Prius ownership, look south. What is the quintessential Seattle car? If the outdoorsy Subaru represents Seattle’s free-spirited inner child, then the Earth-friendly Prius plays the role of responsible parent. It’s not surprising that the rate of hybrid ownership in the Seattle area is high. At 5 percent of all vehicles, it’s slightly more than double the national average, according to Nielsen Scarborough market research. But as you might have guessed, even within the Seattle area, the popularity of Priuses varies from place to place. To determine the rate of Prius ownership around King County, I compared the state Department of Licensing (DOL) data for personal-use vehicle registrations against U.S. Census Bureau estimates for the numbers of car-owning households in each ZIP code. When I saw the data mapped, it wasn’t what I was expecting. I figured the Prius hot spots would be in North Seattle — or perhaps Vashon Island — and indeed, both of those areas have some of the highest ownership rates in the county. They fit the stereotype: liberal, affluent, white. But I didn’t anticipate similar levels of ownership just south of Seattle, in a highly diverse and economically challenged area that is home to many newly arrived immigrants. In fact, the ZIP code that ranks No. 1 for the highest rate of Prius ownership is 98188, in SeaTac and Tukwila. The data show there are 414 Priuses for every 10,000 car-owning households, handily beating out the second-highest ZIP code, Seattle’s 98115, which includes the Ravenna neighborhood. So what’s going on south of Seattle? I decided I’d ask someone who might know, so I called Toyota of Renton and spoke with sales consultant Joen Fisi. The county does not share data on Uber drivers, so we’ll have to rely on anecdote that many reside around Tukwila and SeaTac, where about 40 percent of the population is foreign-born. Uber’s general manager for Seattle has acknowledged that the vast majority of the company’s drivers here are immigrants. “It’s an incentive within the Uber platform for drivers to get the lowest cost possible per mile” — in other words, they pay for their own gas — “and that leads naturally to using fuel-efficient vehicles like Priuses to reduce their gas cost.” Priuses can get more than 50 mpg in city driving. Taxis, by the way, are not included in the data because they must be registered as commercial vehicles. The Eastside is at the low end of Prius ownership — the farther east you go, the fewer there are. Carnation’s 98014 is home to just 15 lonely Priuses. But Eastsiders are way out in front for electric cars. All the top-10 ZIP codes for the top-selling electric car, the Nissan Leaf, are on the Eastside, with Sammamish’s 98075 leading the pack. There could be a practical explanation for that: Suburbanites are more likely to live in a home with a garage where an electric vehicle can easily be plugged in. The data also show the Eastside is the epicenter of Tesla ownership — and granted, with a sticker price starting around $75,000, these are luxury cars first and electric vehicles second. Medina’s 98039 beat out a couple of other ritzy ZIP codes in Mercer Island and West Bellevue as the top spot for Teslas. So is the Prius the quintessential Seattle car? Popular as they are here, they still don’t threaten Subaru. 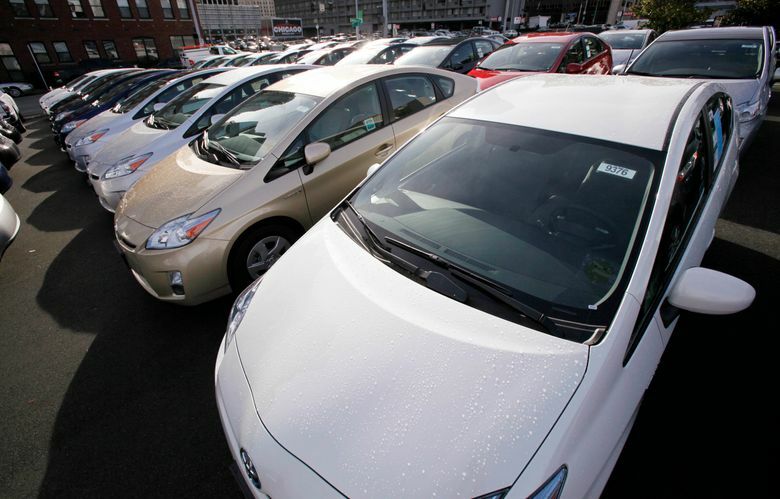 DOL records show there are about 13,000 Priuses registered as passenger vehicles in King County. Subaru’s most popular model here, the Forester, numbers nearly twice that.